"James A. Carasella has been cooking Italian for charity perhaps longer than most of us have been alive.But the 89-year-old World War II veteran may have outdone himself this week. Carasella, of Jeannette, Pa., made 150 pounds of gnocchi by hand for Sacred Heart Church to host a fund-raising dinner on Saturday. That's 8,000 of the potato-and-flour dumplings. Producing them at about 10 pounds per hour in his basement, Carasella understandably had his five children and their families help him. Recent hospital visits for a bleeding incident and a broken thigh slowed him down, as well. 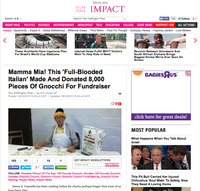 "I was going to make sauce but I don't have time," he told The Huffington Post. Asked why he chose to donate gnocchi, he answered simply, "Because I'm a full-blooded Italian." Carasella is no stranger to cooking on a large scale. While working as a firefighter in the 1960s, he founded Maria's Products, a regional purveyor of pasta sauce and noodles. At its peak, Maria's distributed to 22 stores, he said. Even while running the business and climbing to the rank of fire chief, Carasella still found time to give back to the community through his culinary skills, passed down from his mother. He cooked pasta dinners and donated sauces for the Kiwanis Club, Salvation Army, American Legion and churches. He cooked for those who had nothing. Now he's helping his church gather funds to celebrate its 125th anniversary next year. He's thrilled to pitch in and happy to discuss his charity work. But when HuffPost asked him for his gnocchi recipe, he clammed up. "It's registered with the Department of Agriculture," he said.